Derbyshire, Leicestershire & Rutland Air Ambulance (DLRAA) have begun operating with their brand new state of the art helicopter. The Agusta Westland AW109SP Grand New is one of the fastest civilian helicopters in the country and can reach speeds of 185mph. The helicopter was handed over to DLRAA by Sloane Helicopters, who provide all three helicopters for The Air Ambulance Service. After a few days of familiarisation with the pilots, the helicopter took off on its first mission from East Midlands Airport on Friday 25th October. The new helicopter is equipped with a number of technologically advanced features which increase safety and reduce pilot workload. Compared to the previous model, the new helicopter includes more advanced GPS, radio and autopilot features, as well as upgraded electric systems. The new autopilot is now capable of carrying out more complex flight procedures. It is also a night capable aircraft meaning the Charity can now look at the need for a night service in its area. All of the new features are designed to make the whole lifesaving operation that DLRAA carried out much quicker and smoother. DLRAA was formed in 2008 and has carried out more than 5,000 rescue missions. They carry out a wide variety of rescue missions. The most common type of incident that DLRAA attends is road traffic collisions, but they also attend horse riding accidents, falls, sporting injuries, and medical emergencies such as heart attacks and strokes. They also regularly service the Peak District, tending to the needs of injured hikers and cyclists. This often means having to land in very tricky locations that are not easily accessible by land. 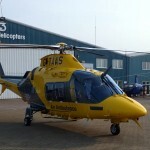 Dan Martin, Head of Aviation, said: “The AW109SP is the latest addition to our fleet of Agusta Westland helicopters. It has one of the highest useful loads for a helicopter in its class, meaning that we can respond over a greater distance and often to multiple incidents on one tank of fuel”. The Charity receives no Government funding and relies entirely on public donations to keep its helicopters flying and its crew saving lives on a regular basis. Each rescue mission costs the Charity between £1,400 and £1,700.